Whether Barnea grasps it or not, this is indeed the vision more and more Palestinians have in mind and this is exactly the vision I have in mind. This is the exact vision more and more people around the world envisage as a perfect solution, and clearly, this is the only ethical and universal solution to this bitter conflict: Israel will be Palestine. It will stretch from the river to the sea. And it will be a State of all its citizens as opposed to the racially exclusivist ‘Jews only’ State. It doesn’t take a genius to gather that Barnea, like many other Israelis, expresses wishful thinking here rather than a reading of the reality on the ground. As it happens - and more than a few of us detected it decades ago - Palestinians are at the forefront of a battle for a better world. The current regional Arab revolution is a mass call for justice, but also for justice in Palestine. As much as the world looks with admiration at young Muslims and Arabs making a change, it also becomes general knowledge that Israel is the biggest threat to world peace. The Palestinian Right of Return is about to become an international priority issue, and Israel will be defeated on that front. The West wouldn’t hesitate to sacrifice Israel on that issue: isolated and humiliated, Israel is going to struggle hopelessly against the entire region. And to clarify the matter, time is not exactly on the side of the Jewish State. Israel has had sixty-three years to confront its original sin. It had a window of opportunity to repent, and open its border to the millions of refugees it so brutally expelled. But now the window seems to have been closed. Israel has lost the chance to save itself from itself. And what we saw this week was just an introduction. Israel is about to face a tidal wave of Palestinian gatherings on its borders. Israel doesn’t possess the political or military means to deal with these emerging forms of non-violent resistance. Barnea stresses that Abbas refrained from clarifying the question of how, and where this right will be realised, and whether it will be through compensation or physical return. Barnea concludes that “anyone could make what he wanted” out of Abass’ words.” But in fact Barnea is wrong again. Abbas' words were totally clear: there was no hidden message or even ambiguity in them. The return is not a slogan. For a while it was a universal and an ethical call. But as things stand this week, it is now becoming a call for a direct action. Barnea and most Israelis may still fail to grasp that today’s Middle East is a new entity all together. It is united; it is firm, and it is far from timid. It is vibrant, and revolutionary, and fuelled by yearning for justice and freedom. Israel is surrounded by a wall of fierce resistance. As far as the Jewish State is concerned, the countdown has begun. Yet, a universal reading of Barnea’s suggestion surely also logically implies that the rest of us then, can also now relieve ourselves of the endless burden of Jewish exceptional suffering too: after all, Barnea did say, ‘what’s in the past is in the past.’ Accordingly then, if the Jews are not unique in their collective pain, nothing should stop the Israelis from opening a new page too, so they can cross the divide and build bridges with the indigenous people of the land; those whom they themselves ethnically cleansed and attempted to destroy. 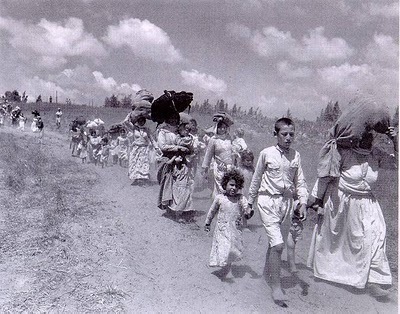 For if the burden of the past can, as Barnea suggests, lose its relevance or significance, Israel might as well live up to that, and turn its face to a brighter future and voluntarily invite the Palestinian refugees to return to their land. Such a move would mean an immediate end to the conflict. Yet, there is one crucial (currently hypothetical) question I must address: nowadays, when it becomes clear that the Jewish state approaches its final phase, how would Israelis who would like to return to Europe react to a Barnea-like ‘no return’ statement if it were expressed by a European ‘liberal’ columnist? How would Israelis or the rest of us react to the following: ‘there will be no return-time has come to tell the Jews they will not be returning to Europe’? Yet sadly enough, we are all too used to hear similar statements from ‘liberal’ Israelis and Jews.